Burlington, Vt. proper has a population that's smaller than Framingham -- just 40,000 people (plus several colleges) -- yet it boasts a thriving downtown and rejuvenated waterfront. We were there yesterday, on a Sunday afternoon, and the 4-block pedestrian-only retail area was packed with people. There was a special street performer festival going on, but several locals said the crowds were typical. What makes it work? What lessons could Framingham learn from Burlington's success? * A huge amount of effort was put into making a walkable city. The waterfront is connected to the downtown shopping area, and both are connected to nearby college campuses. It's not merely theoretically possible to walk between destinations, but the streetscape makes you want to stroll. Cars don't whiz by within inches of walkers, there's separation and screening. And intersections are crossable on foot. There's also a free shuttle running between college, downtown shopping and waterfront. Contrast that with the highly unpleasant corridors between Framingham's train station and retail area, Framingham State, and nearby parks and ponds. * The city's colleges aren't hidden away, physically separated from the rest of the city, but are well integrated and bring foot traffic and life to nearby retail. "Twenty-five years ago, the four-block stretch between Main and Pearl streets was open to automobile traffic, and lined with shops that met a small city's everyday demands -- it was easy, on a weekday afternoon or evening, to entirely forget that this is a college town. All that changed when the core blocks of Church Street went all-pedestrian," note Kay and Bill Scheller in "Best Vermont Drives." Funny how catering to foot traffic turns out to be good for local business. * The heart of the city's retail district is, yes, devoted to retail -- shops and restaurants, not things like medical offices, insurance offices or financial businesses. Yes, Burlington also has a Salvation Army center and food kitchen downtown, conveniently located a couple of blocks off the main shopping area. * The city's sense of place is palpable. Even with some chain stores in the Church Street pedestrian mall, there were so many locally owned shops that I didn't feel like I was walking around a slightly different, outdoor version of the Natick Mall. Because of that city form of government, one leader with a vision of how to change the community's direction could win the support of voters and spark a transformation. I'm encouraged that Framingham is working on downtown revitalization plans (something we've been hearing about on and off for decades now), but real change isn't quite as easy in a representative town meeting form of government, where most elected "representatives" easily win re-election without opposition, and voters have no idea what their "reps" stand for or how they vote, since almost no votes are recorded. You can view a half-minute snippet of downtown Burlington below. Sounds wonderful, but I wonder if Framingham, or any typical town, can pull off what Burlington did in the absence of a large college population, a waterfront, or some other source of leisure walkers. I guess the town could increase sponsorship of farmers markets, boutique retail, free outdoor concerts, and the like in an attempt to become a "destination" town, and then rejigger the traffic and parking layout to keep downtown walkable. But there seems to be a chicken or egg problem, with "hip" and "walkable" daring the other to go first. The work of Richard Florida would seem to suggest that the town needs to attract hipsters (college students, gays, artists, etc.) to thrive. So maybe the ticket is to offer a serious amount of artist and office loft space near the train station as a starting point. Seriously, though: how many walkable, livable downtowns of the type you imagine don't have lots of college students or a waterfront? Framingham might not be able to pull off what Burlington did on the scale of what they did. However, there are almost 6,000 college students in Framingham Center, and it is simply insane that there is not an attractive pedestrian area between the college and downtown, and a smaller pedestrian-friendly retail streetscape that would draw the college community there. Even Framingham Center retail is a pedestrian-hostile walk across a terrible intersection, with an ugly, unwelcoming pedestrian bridge over Rte 9 and uninviting streetscape on the immediate beginning and end at both sides. Thanks for the memories, Sharon - I'll be stopping in Burlington overnight soon on the way back from Montreal. That city has done a great job of making downtown compact, walkable, and attractive, and people come from far away to hang out there for a weekend (I certainly have!). Inspirational for Framingham, tough to implement in many ways though. True, Burlington has fewer residents, but the downtown core is nicely concentrated whereas our fair town is very spread out and very large. Still, there's a lot we can learn from and do to improve it. Enjoy Burlington - and Montreal, both great pedestrian cities. As for Burlington vs Framingham, I agree that certain areas of Framingham can't be made walkable the way they are now. But much of the area along and south of Rte. 9, as well as Saxonville and right around Nobscot center, already have development patterns that make walking feasible. It is especially nuts that there is not a better, more appealing pedestrian corridor between Framingham State and downtown, between the train station downtown and retail blocks, and between retail areas and proposed new housing. Rte. 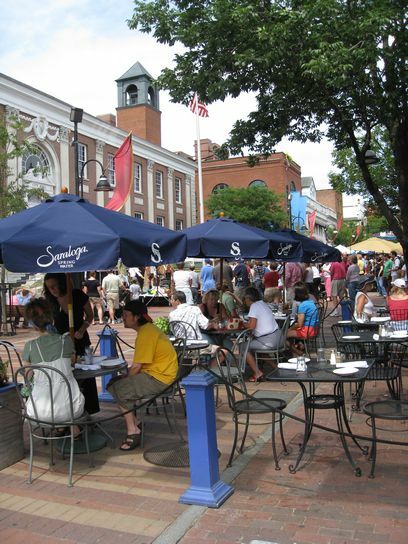 30 could have been developed with stores near the sidewalk and restaurants with outdoor seating, just like in Burlington but without excluding auto traffic; put parking in the rear, make a fabulous walkable boulevard. Why couldn't we have done that with a little vision? Trader Joe's in Brookline is up at the sidewalk with parking in the rear and doorways on both sides. Why couldn't Trader Joe's in Framingham be the same, allowing nearby apartment residents and office workers to walk there? Because nobody gave the slightest thought to the concept that people might want to walk someplace instead of drive there. That's all. In Saxonville, a rebuilt library could have added much to the walkability of the neighborhood. Some development taking advantage of the riverfront would also help, as would getting a neighborhood food market back again someday. Bus from Framingham to a T stop in Newton?